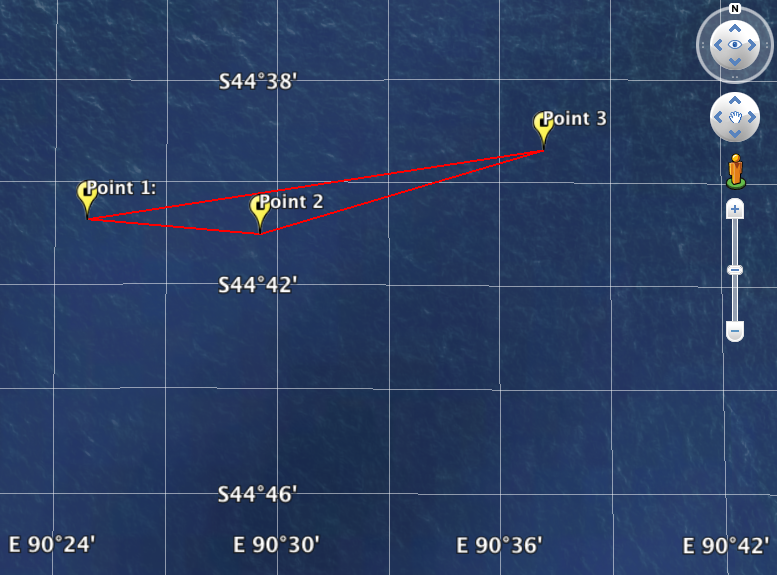 Previous PostMH370: Updated route, final radar plot (Updated)Next PostMH370: Google adds satellite search imagery to Google Earth; black box heard? Very interesting observations Stefan. Let’s see what turns up when they start zooming in to find the black box. Apparently the signal will only be emitted for 30 days. To me, it looks as if they flipped the image, making South at the top, and at a slight angle. Could that be a possibility? No amount of flipping and rotation would change the shape of the triangle. The distances between the points are not the same, nor are the angles. Agree to your conclusion on the wrong coordinates 100%, i got the same results. One more part in the collection of total wrong information about flight MH370… more to come??? I couldn’t quite believe it – this image is all over every news service – so had to check the coordinates as well, with the same conclusion. 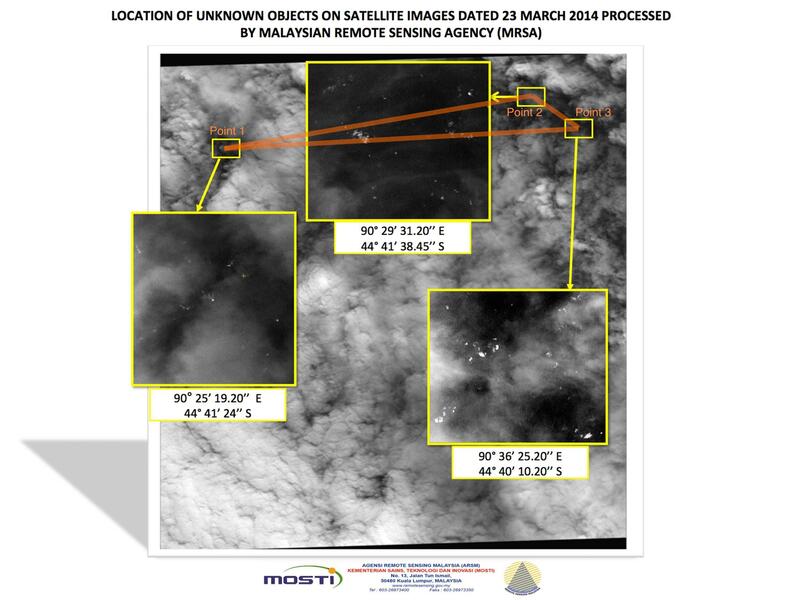 Those 3 satellite images were released to the public back on March 23, 2014. Remember it was the third set of images released a few days after the first two on March 16 and March 18. A casual inspection of the south latitude values clearly showed me that point #3 had to be further north than the other two since 44-40-10 is smaller than either 44-41-24 or 44-41-38, thus point #3 was closer to the equator. I emailed CNN about that discrepency the same day but never heard back from them. 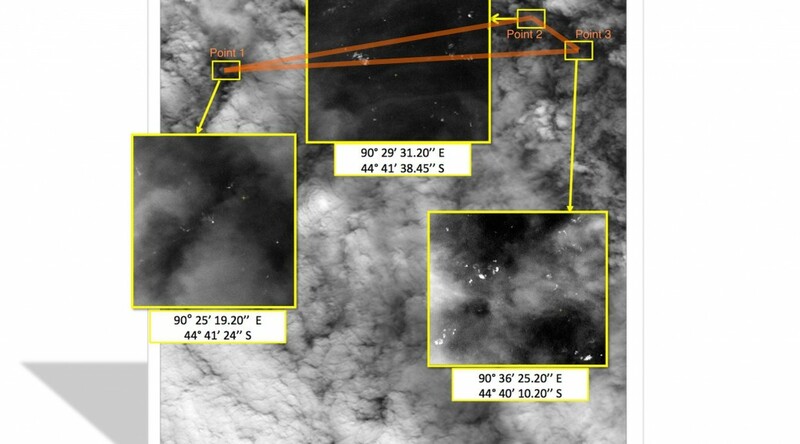 They continued to show the images incorrectly for several more days, until the next search area to the southwest published on March 24 was eventually given up on. Stephan, I don’t mean to quibble, but shouldn’t your point #3 be plotted just a bit below the unlabled 44-40 S latitude line? Good point — but what you see is an optical illusion. Google Earth’s coordinate lines straddle the ocean floor, while the points of interest are at sea level. I took that screenshot from the top right edge of the screen with North up, so the points look more northerly than they are. Try it yourself in Google Earth and you will see that you can create a parallax effect by moving your point of view. It’s a bit unfortunate but the KMZ file is completely accurate. I’d think Google Earth would project the geodetic graticule onto a sea level surface. But I take your word for it. Unfortunately my public library here in Fort Myers does not see fit to buy Google Earth or even put an academic version on their system! I need a new laptop!! I did just check again. But do check yourself when you get access. I thought more about how Google places the geodetic graticule onto the sea bottom surfaces. Does that mean they also do it in reverse for high terrain surfaces as well? I used to be a geodesist for a U.S. national mapping agency, now retired. I assure you back then we carefully positioned the graticule onto an ellipsoid or geodetic datum that approximated a mean sea level surface. I know this is not the correct forum for any discussion of JORN, but here’s another URL I found in one of my emails to some associates. This shortened renamed brochure (down to 6 pages from 9) is quite similar to the previous one, but it apparently was edited and released only 2 days later on June 14, 2011.